My sister sees one all of the time from her high rise window at work in the downtown area. The Peregrine Falcon has a hankering for pigeons and she will see them swoosh past her window going for its intended meal. This bird can capture a bird in mid air at speeds of up to 240 miles per hour. I’m not sure if my sister spots them going at this particular speed but nonetheless that is amazing if you ask me. You see the Peregrine Falcon is considered the fastest bird in the world. The next fastest is the Golden Eagle going at top speeds of 200 miles per hour. You may be able to spot a Peregrine in your own city as they have adapted well to large city areas. Why? Because in most large cities you will find pigeons which is their favorite bird to eat. Peregrines eat other birds too such as mourning doves, shorebirds, waterfowl, ptarmigan, grouse, and smaller songbirds such as jays, buntings, larks, waxwings, and starlings. The Peregrine Falcon is a bird of prey. It has dark blue-gray wings that are barred underneath, a light colored spotted underside, barred tail and legs with thick orange talons and a hooked beak. You will note a blue-gray wide streak reaching from each eye to its neck. They stand 15 to 21 inches with a wing span of three and a half feet. Peregrine Falcons can be seen on every continent with the exception of Antartica. Look for them on high perches such as bridges (where we usually see them), on skyscrapers, high towers, near power plant towers, and on cliffs. They can also be found in the desert, on the tundra, and in the tropics. Peregrines mate for life and breed in the same area year after year. In North America it is also know as the duck hawk. 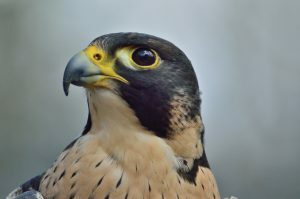 Peregrines have few natural predators in urban areas but in more remote areas Great Horned Owls, Eagles, martens, and some snakes prey on young juveniles. 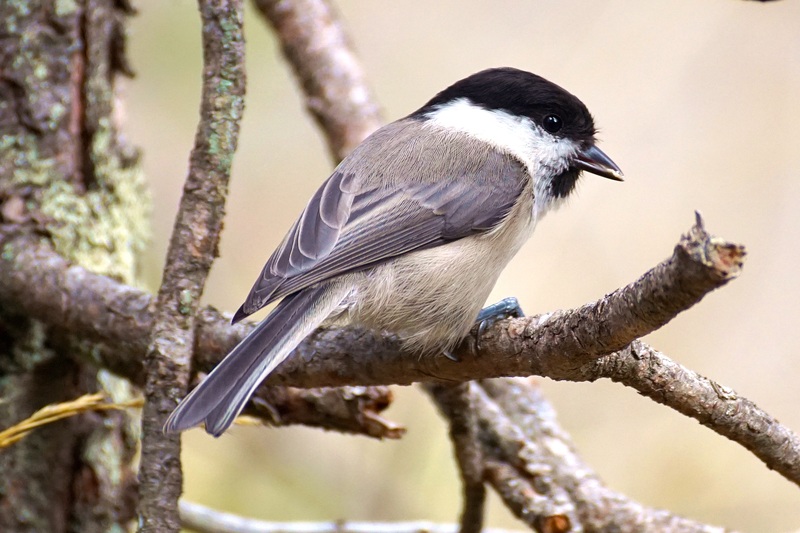 There are an estimated 1650 breeding pairs in the United States and Canada. Some places set out webcams to watch the nests. Baby Peregrines are called eyasses. They eat a lot of food doubling their weight within six days after they are born. This falcon captures its prey with its clenched talons in mid air usually killing it on impact. If its intended target is too heavy to carry it will drop it to the ground and eat it there. 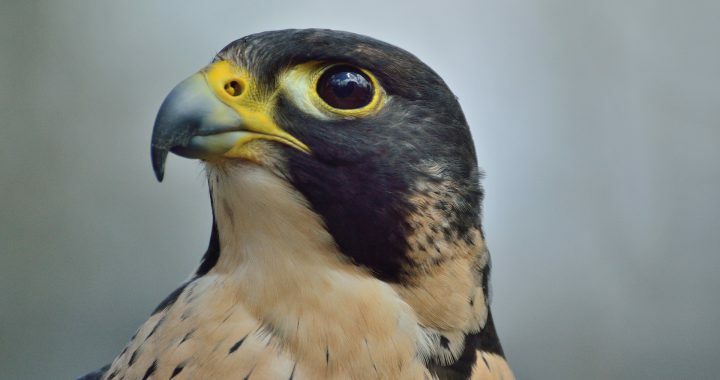 A falcon’s eyesight is 8 times that of a human. 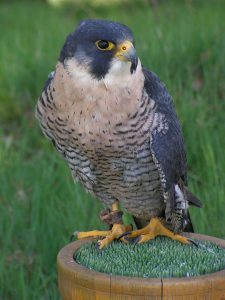 Peregrine Falcons almost became extinct and was on the endangered species list. This is due to a pesticide used to kill insects called DDT that harmed the birds and eggs. DDT was later banned in 1972 by the EPA. In 1999 Peregrines were taken off of the endangered species list. They’re thought to migrate as far as 15,500 miles to mate or to find food. When not hunting it flies at a speed of 50 to 60 miles per hour. Females are about twenty percent larger than males. In summary, the Peregrine Falcon can obtain speeds of up to 240 miles per hour as it dives for its favorite food…the pigeon. It also likes to eat mourning doves, shorebirds, waterfowl, ptarmigans, grouse, and smaller songbirds such as jays, starlings, waxwings, larks, and buntings. Peregrines have adapted to living in urban cities where pigeons and doves are abundant. You may find them on top of tall buildings and ledges watching for their next meal. They also like to hang out on high overpasses such as bridges, up on water towers, power plants, and on cliffs. Look for the dark grey bird about 15 – 21 inches with barred underparts and legs, a dark grey wide streak that extends from its eyes to its neck, orange talons, and a hooked beak. They usually can be found in the same general area year after year too. We know if we go downtown to watch in a certain spot we may see one. There is also a bridge connecting to Ohio that we always check for one as we often see one there too. Some states have set up webcams to watch the nests of Peregrine Falcons. You may want to check your own town to see if they have one. Have you ever seen a Peregrine Falcon? If you have anything you would like to add to this feel free to make your comments below. I went with my husband like three years ago to a falconry centre, and I had the honour to hold one of these magnificent falcons, although he was pretty scared with the bald eagle resting on a branch. It’s amazing that goes at 240m/h, thank goodness it’s not huge otherwise we would be their preys too! I don’t like pigeons that much and I’m glad they hunt them for food, pity they would go after smaller and prettier birds too! Yeah DielleBee, peregrines will go after the prettier birds but the pigeons are much tastier to them :-). That’s why you see them in downtown areas around tall buildings as that is where the pigeons are. They are pretty amazing going at such speeds, I agree. Thanks for your comment! Great information. I always believed Golden Eagle is the fastest bird, thanks to your article I improved my general knowledge. Though, I never saw peregrine falcon I would love to see one. My young nephew brought be closer to birds, he is 11 years old now and loves birds like anything. I am so glad that I found your article, I will share this with him. Thank you so much for sharing this information. Thanks for your comment Chloe! I think that your nephew would really like the Peregrine Falcon. It is such a fascinating bird to watch in action.